The Webb School’s Bond Library – approx 10,000 sq. Ft.
A starting point to organize and begin a massive weeding project is to get a feel for the physical space. 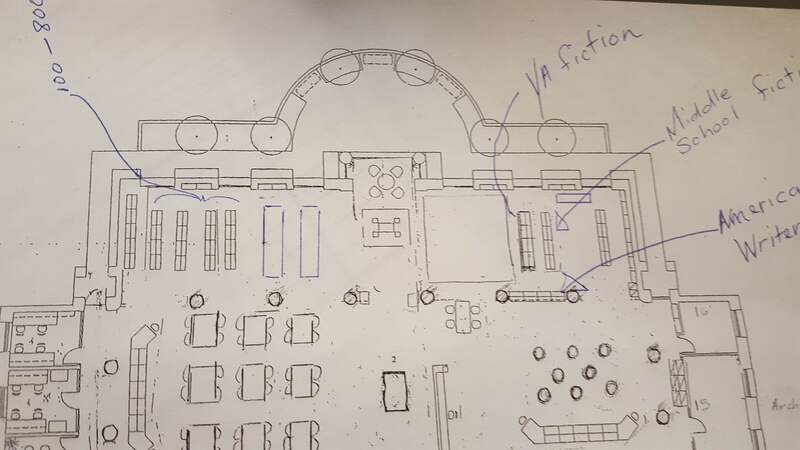 Some may want to use a computer to draw out the shelving to scale to understand how shifting books will affect the area. I like to use the blueprint version of my library that was provided for emergency escape routes. Some projects may be so large, removing a shelving unit might be necessary. As mentioned in an earlier post we use Follett’s TitleWise collection analysis tool to analyze our collection. There are a couple of areas to look to when weeding. 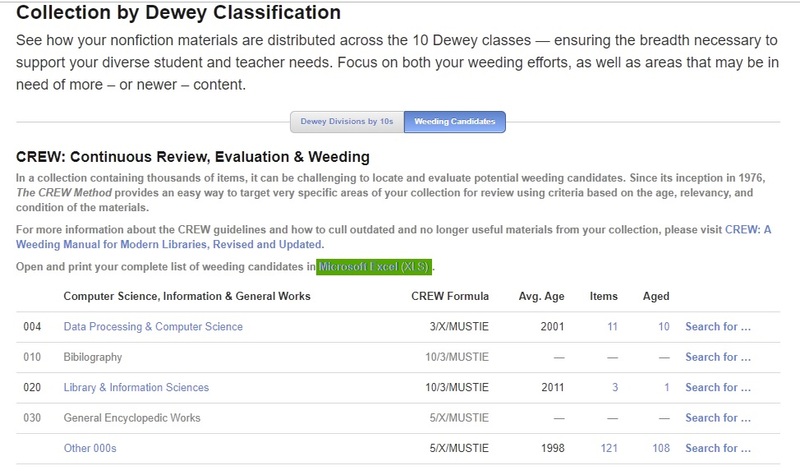 One aspect of this collection analysis compares the collection percentages of Dewey categories with the recommended proportions. The Webb School’s collection is dense in the non-fiction categories. Follett’s analysis has an area that focuses on age-sensitive titles. This function will help determine what needs to be weeded first. They also provide a weeding candidates list that can be downloaded as a spreadsheet. However, it is not prudent to follow such recommendations blindly. Always use these tools as guidelines but not hard and fast rules. For instance, we have some valuable books in our history collection that are over the “recommended age,” but they cannot be accessed online, and the hard-copy books are perhaps out of print. If we refresh these books with new dust jacket covers, we will retain the books, especially if they are part of the curriculum. 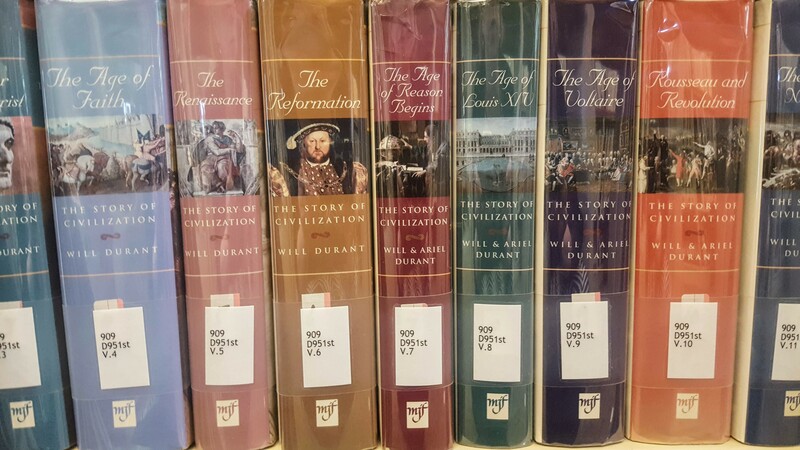 One series, The Story of Civilization by Will and Ariel Durant, is considered a most comprehensive and classic work on world history; however, the latest reprint was in 1993. We will keep this set even if it is beyond the acceptable age. I am most hesitant about using circulation statistics for weeding more than any other data. We have classes that come to research in the library almost daily, and these visits often result in very few circulation transactions. Though we scan books for in-house circulation, this is not accurate when students reshelve books. If we relied solely on circulation data for removing books, we would discard far too much from the collection. Can a 2015 study about choice overload teach librarians about arranging library shelves for its patrons? As librarians, we are charged with teaching inquiry and critical thinking. In the cases when students encounter “choice set complexity” or complex information beyond their current learning, we as information professionals need to curate resources so that students can engage with the collection. As we weed, we will find new ways to group and curate these collections to match student and curricular needs. To limit “decision task difficulty” we can determine ways to place books and use open space informed by these consumer studies. 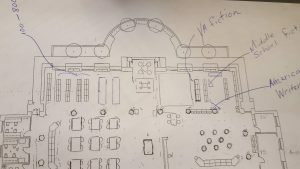 Designing the physical library arrangement after weeding can include decisions about placement of complex resources. This practice can also help students in the task of comparing multiple resources and conquer “preference uncertainty.” Many libraries today are using genre organization or bookstore shelving. These systems have improved both the experience of the patron who does not know what he wants and those who wish to have a convenient or easy choice. When making a weeding call, ask “what is the goal or purpose of the item?” then do the best to help students with their “decision goal.” It is a great feeling to connect a student with just the right piece of research or reading. Above all remember that every community is different. You want to include your stakeholders in this process — most school’s value decisions with research and best practices as a rationale. 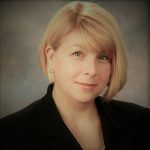 ‹ Your 2019 AASL Social Media Superstars! Thank you for this very helpful article. We also have many lessons in the library during which students use books that they don’t check out. I never thought of using this as a defense for keeping certain books but now I’ll be much more aware of it when I do my next weeding at the end of the school year.